I received this pretty floral fit and flare dress in my February Fix: Fix #15. To see two of the other items I received in that Fix and that I have already reviewed, go HERE and HERE. This is the third item I am reviewing from that Fix, and like the other two I sent it back. But it was hard for me, as I really liked this dress. It just was a little tight for me in the bust which made it uncomfortable...and you know me...I am all about being comfortable in my clothes! I love the floral design with the solid navy blue bottom. The colors are so pretty as well! In addition to the bust area being a bit snug, I also did not like the small straps. Even though they are not spaghetti straps, I really prefer more material on my shoulders so I can wear a regular bra with it. Since I returned the dress, this item was styled for photography purposes only. 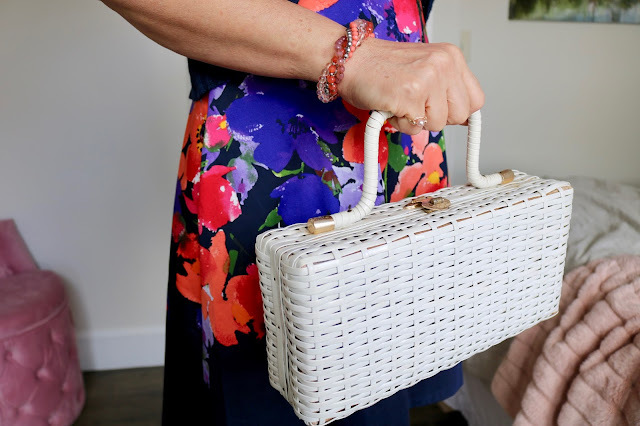 I chose a white vintage wicker bag because I thought it was fitting with the classic dress. For jewelry I chose to pull out the corals in the dress with a statement necklace and beaded bracelet. The blue knit shrug is from my own closet. I love these shrugs for covering bare shoulders in the summer. So what do you think? Did I make the right decision in returning this dress? I'd love to hear from you! Amy! That dress is so you!! I LOVE IT!! That dress is beautiful. Too bad you couldn't keep it but you are right if it's not comfortable you won't wear it. Thanks Marie. I really did like it, just felt uncomfortable in it and I knew I wouldn't wear it that much. Loving these colors and the style of the dress. But I understand why you sent it back, wonder if you could request in a size up? It's gorgeous! Thanks Elli! Yes, you can request an item in a different size, but I was also unsure of the straps. If it had more of a sleeve, I definitely would have done that. Stitch fix seems so fun, I’m going to have to try it one of these Days! They defnitely are fun! You should give it a try! It's a sweet dress but I've made mistakes keeping things that tug over the bust, so you're being wise to return it. Hugs my sweet, x. Thanks so much. At my age, I know my bust is not going to get any smaller! haha! Thanks Mica, that's great advice! That's a shame about the dress Amy. It looks gorgeous on. I'm admiring the vintage wicker bag! Thanks Laurie! I've had that bag FOREVER. I have no idea where it even came from. It's such a pretty dress and so suits you. What a shame it's tight. Other than that I'd have used a strapless bra if it were just the straps that were the problem. Tough call, girl. I agree about the straps. That would be a concern for me because I detest wearing a strapless bra. And we can't feel how tight the dress felt across the bust. It looks amazing on you and I love the colors. As always, your accessories are perfect, too. I was sad that you returned the bright floral top. I really LOVED that on you. Your great pieces make me wonder if I should play the lottery and try Stitch Fix again. Thanks Leslie. I do regret returning that top, and maybe this dress too. I wish Stitch Fix gave me more time to decide. The dress is pretty and the print is outstanding! But if it didn't fit quite right I would send it back to. After all, you want to feel good about what you wear and if all the boxes weren't checked off then no point in keeping the item. That's such a cute dress on you dear. Lovely colorful floral prints, and really cute bag to go with it too! Beautiful dress! It looks so cute with the bolero cardigan. The colors and print are so pretty. It's too bad it didn't work out because it looks great on you. Thanks for linking up with Fabulous Friday! Thanks Jennie! I'm thinking of asking for this dress in a larger size for my next Fix. Hopefully it'll still be available.